It’s another Monday, so it’s time to look at another way writing is trouble. This week, we’re looking at the best times to write. Sometimes, the time you write the best isn’t always the most convenient time to write. For example, I get my best ideas at night. And I’m talking late really late at night. When most people are asleep. You get the picture. But, if you’ve been reading for any length of time, you know that I have a day job, and can’t always write at night. Not if I want any hope of staying awake during the day and keeping my job, anyway. Wait, what were we talking about? Oh, yeah. Writing. So, you’re making yourself write, then you run into a different problem. 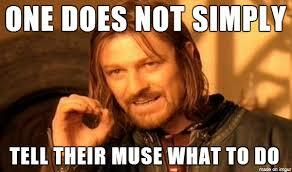 No muse! Isn’t that the most frustrating thing? Here you are, trying to be productive, and then absolutely nothing comes to you. Nothing. Nada. Nope. You get the picture. I guess that’s the big problem with being a writer. We all have other commitments in life that prevent us from writing when we have our best ideas. That’s why I like to keep a journal in my purse. It keeps me sane. I put ideas down while I’m at work so I don’t forget them. So, when is your best time to write, and what do you do when you can’t write at the time? Comment below!